Creating an effective financial plan takes times, know-how and experience. Even if you are using popular consumer financial tools, planning on your own can be overwhelming and frustrating. Consulting with a financial advisor not only reduces your workload, but also helps ensure that your plan is comprehensive and based on current trends and data. 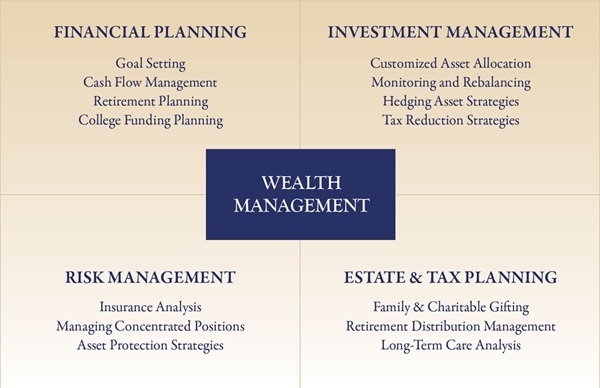 Financial Planning pulls all your finances together, organizing them and making management easier and more effective. The more you understand and better manage your wealth, the more likely you are to achieve your goals and dreams. Addressing your monthly budget is an important first step in successfully managing your overall finances. Failing to have a clear picture of your regular recurring bills and expenses can dramatically reduce your ability to meet your financial objectives. Risk can take many forms: illness, accident, liability and natural disasters, to name a few. Failing to manage risk properly can jeopardize your financial future. That is why smart financial planning evaluates the various levels and types of insurance you carry to make sure they are aligned with your overall goals and needs. In many cases, insurance can also be used effectively as an alternative revenue stream and a hedge against inflation and riskier types of investments. Your legacy is in your hands. Only through diligent monitoring can you be assured that your assets will be transferred effectively and according to your wishes to the people and charities you care about most. Establishing trusts, regularly reviewing your legal documents and beneficiary designations, and examining tax implications for survivors are vital to establishing a plan that provides you and your loves ones with greater confidence and security.